After knitting for over 20 years, with a variety of needles on everything from hats to socks, and talking to fellow knitters, we’ve determined that Knitter’s Pride Karbonz Double Pointed Knitting Needles are the best double pointed needles. It’s the only dpns we’ve used that is made from a material designed to prevent stitches from falling off the non-working tip, while still allowing yarn to move smoothly. Their warmth makes them ideal for long hours of knitting and for anyone with hand pain or arthritis. Known under the brand name, Knit Pro, outside of the US, we love these knitting needles, no matter what name they’re sold under. To help show why we think they’re the best double pointed needles, we’ll go over the criteria we used for picking them and how they compare to similar products. Beginning knitters will appreciate the Knitter’s Pride Karbonz Double Pointed Needles ability to help you control your tension – whether you knit tight or loose. What you may appreciate even more is how the carbon fiber needle decreases the chance of stitches falling off while you learn how to knit with double pointed needles (dpns for short). It’s a reliable needle for knitters looking for a dpns that can be used for a variety of yarn weights – cobweb to worsted. Because it’s a new style of needle, knitters looking for cutting-edge tools will enjoy the new options the Karbonz offers. Taking a hint from race cars made from carbon fiber, Knitter’s Pride Karbonz double pointed knitting needles take you from cobweb to bulky yarns with ease. Beginning knitters will like using double pointed needles made from carbon fiber as they forgive the tight knitter and the loose stitcher. Expert knitters will enjoy the almost equal slipperiness of stainless steel in a durable dpn. Unlike most dpns which start at US size 0, Karbonz double pointed needles start at size US 00000, which means your more delicate work will stand out – great for anyone who enjoys making doll clothes or miniature items. Made from carbon fiber, Knitter’s Pride Karbonz Double Pointed knitting needles give knitters something new and different to use. Dating back to the late 19th century when baked cotton thread was used as a filament for light bulbs, carbon fibers have come a long way. You won’t need to bake your Karbonz double pointed needles to enjoy this new addition to knitting. Although not as grabby as bamboo or wood, carbon fiber needles grab yarn more than stainless steel needles; a bonus for beginning knitters when first using double pointed needles. Additionally, electroplated polished brass covers the tips of Karbonz dpns. Karbonz double pointed needles come in 6 inch and 8 inch lengths. What great options, especially if you’re using larger yarn weights! Additionally, the 8 inch works well for anyone with larger hands or for anyone who experiences hand fatigue while knitting as there is more to hold onto, thus reducing stress on the hand. 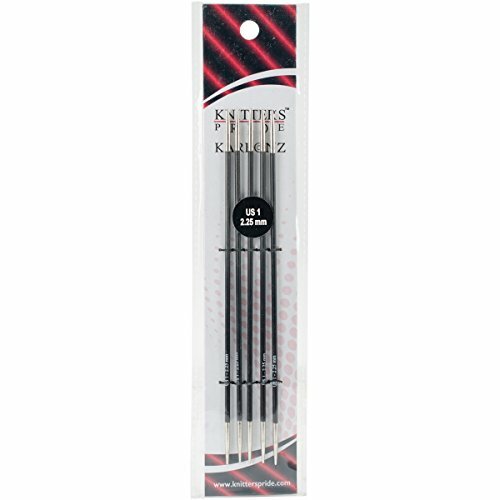 Knitter’s Pride Karbonz Double Pointed needle tips take you from lace weight with pointed tips on the smaller sized needles to worsted and aran weights with rounded tips on the largest sizes. Made from nickle plated brass, the highly polished tips work well for even the smallest yarn weights. Experienced knitters find that the tips of these dpns move under yarn without splitting it. 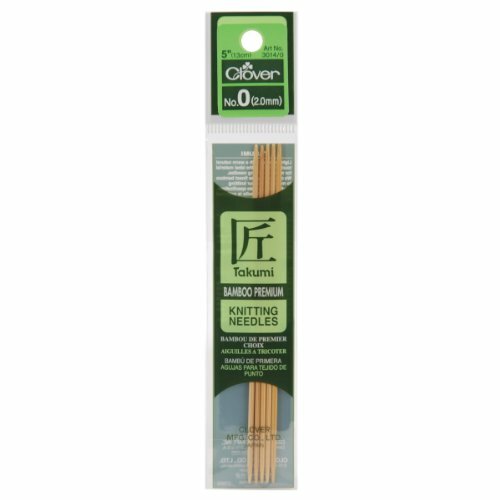 Sized US 00000 – 10, these knitting needles provide exceptional variety for all your knitting project needs. They come packaged as a 5 needle set for any given size. Have a new sock pattern you’ve been wanting to try? Can’t wait to get started on those Fair Isle gloves? At any size, these sturdy double pointed needles make your project hum! Karbonz double pointed needles work best with fine yarns up to worsted and aran weight yarns. As there is limited stitch space on a 6 or 8-inch needle, bulky or chunky yarns will only give you a few stitches. So its probably not worth your time using them with larger yarn unless an i-cord is your next must-do project. Unlike bamboo, carbon fiber needles stay strong even at the smallest sizes. No worrying about breaking a needle during your project! To create carbon fiber knitting needles, manufacturers heat polymers to a high temperature without burning, which creates a dense, strong product. Although lightweight, carbon fiber dpns are stronger than stainless steel. They’re heat tolerant and won’t melt or bend like lighter weight plastic needles. However, some knitters have experienced the joins coming loose where the tips connect to the carbon, causing yarn to snag. We’ve never had this issue personally, but we want you to be aware that it may happen. Lighter than stainless steel, knitters experience less hand fatigue when using carbon fiber needles. Experienced knitters might find the Karbonz dpns to be somewhat grabby, but not enough to make you wrestle with the stitches. You’ll still have plenty of speed while using these needles especially with the smaller sizes and sharper tips. Beginners will like the ease of using the pointed tips since the yarn more readily stays in place on the needles. These carbon needles naturally are less likely to have stitches fall off, but if you’re still learning how to use double pointed needles, you may find it best to place a tip protector on the non-working ends of the needles as you knit. Stitches stay on the needles and you can concentrate on your next stitch rather than on dealing with lost stitches. Keep yarn from splitting with the rounder tips on these aluminum dpns. Look to these addi double points to keep stitches sliding but with a bit of grab too. 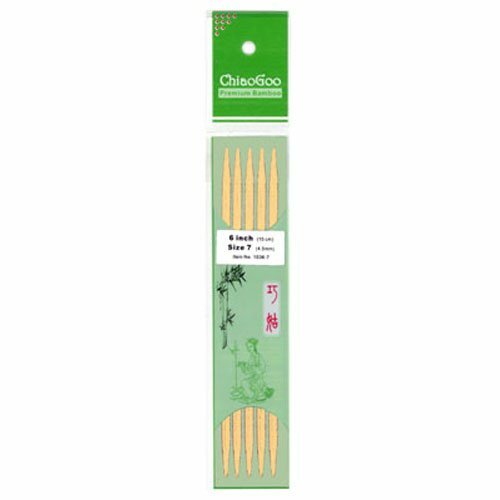 More flexible than carbon fiber, knitters find these ChiaoGoo bamboo double points easy on their hands. Sharp tips on these bamboo needles helps knitters work through tight stitches. Knitters seem to drop fewer stitches with the matte finish and rounded concave points. Eye-catching colorful aluminum dpns from Boye brighten knitting projects. Shorter at 5 inches, Clover dpns may work better for knitters with small hands. Yarn sticks more to bamboo making these needles a good choice for beginners. Beginning knitters will need to be extra careful about dropped stitches on these slick needles. With comparable features to the Knitter’s Pride Karbonz double pointed needles, these metal dpns keep sock knitters happy.